This photo is part of the autograph book of Lizzie A. Dunlap. It is firmly glued in place! Based on the information located below the photo was taken circa 1908, IMO. 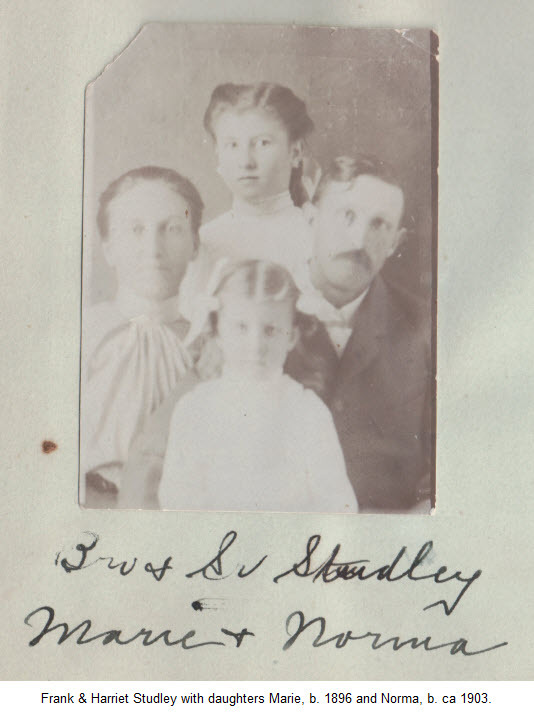 Frank Studley and wife Hattie K. Studley were located in the 1900 census in Lassen County, California. Frank is age 30 with a birth date noted as Oct 1869, Hattie is 30, with a birth date of Feb 1870, and daughter Marie J. is age 3, with a birth date of Jun 1896. The census tells us they were all born in California. The family group includes daughter Norma, age 7 (born ca 1903), in the 1910 census. The little family of four was living in Big Valley, Lassen County, California for the 1920 census. Frank and Hattie moved to Lookout, Modoc County, California. They were located here in the 1930 and 1940 census. Both of them are buried at the Adin Cemetery, Adin, Modoc County, California., Their daughter, Norma Myrle Studley Weigand is also buried in this same cemetery. #T623, roll #88; citing Family History Library (FHL) film no. 1,240,088. #T624, roll #78; citing Family History Library (FHL) film no. 1,374,091. Find A Grave, Inc., Find A Grave, database (http://www.findagrave.com : accessed 27 Aug 2015), entry for Frank Studley (15 Oct 1869-12 Jun 1952), Memorial No. 38,536,372, Records of the Adin Cemetery, Adin, California; page created by J., 19 Jun 2009. Find A Grave, Inc., Find A Grave, database (http://www.findagrave.com : accessed 27 Aug 2015), entry for Hattie Kelley Studley (4 Feb 1870-28 Oct 1949), Memorial No. 38,536,379, Records of the Adin Cemetery, Adin, California; page created by J., 19 Jun 2009. Find A Grave, Inc., Find A Grave, database (http://www.findagrave.com : accessed 27 Aug 2015), entry for Norma Myrle Studley Weigand (7 Jun 1902-20 Jun 1997), Memorial No. 90,395,542, Records of the Adin Cemetery, Adin, California; page created by Not Forgotten, 19 May 2012.